Home ice advantage did not help Russia today, and the Olympic home team finished the tournament today in a disappointing 4-0 loss to Finland, putting them in sixth place overall. Russia had a rough road to get to this game, entering the competition as the favourite for Group B and obtaining that title, but losing their chances at a medal in the quarterfinals after a 2-0 loss to Switzerland. 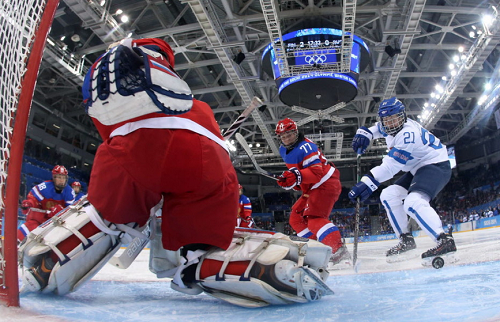 The fight for fifth place was not an easy one, and Finland forced Russia to play a physical game from start to finish. (Finish…Finnish. Get it?). Russia got the first power play opportunity of the game on a Finnish penalty to Jenni Hiirikoski for hooking at 1:42 in the first period. They were only 4/22 on the power play going into this game, and Finland had a 65% penalty kill record in the tournament. Minutes after the game’s first penalty expired, Russia’s Vafina was knocked down and went hard into the boards. She left the ice, but no penalty was called. While Finland dominated in most aspects of the game, Russia had lots of good plays off the boards and fought to try and regain control over their opponents. Linda Valimaki opened up the scoring for Finland and the game, sniping the puck 5-hole on Anna Prugova, which has been a common weak spot for Russia’s goaltending. Their energy was high after the goal, and less than a minute later they scored again, this time at the hands of Riikka Valila at 17:28 in the first, a slap shot off the rebound of teammate Susanna Tapani. The last half of the game saw Russia making some good offensive plays, and creating opportunities around the net. The second period was easily their best, not allowing any goals and only taking two of the five penalties. At times they managed to match Finland in physicality, but it wasn’t enough to give them the fifth spot place they were hoping for upon entering the game. Finland scored and equal strength and a power play goal in the third period to seal the deal and get their third win in six games. The team ended the tournament with 15 goals for and only 12 against, won four of their six games and earned the top seed in Group B. It wasn’t the ending they had hoped for, but Russia put forward a lot of energy and played a fast, physical game and tournament.